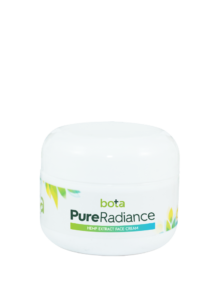 Pure Radiance cream is Bota Hemp’s age defying, skin care formulation. This cream delivers the benefits of CBD to your skin. The combination of their CBD Oil and essential skin care nutrients such as Lavender, Tea Tree, Helichrysum, Aloe, Glycerin, and Grapefruit Seed can leave your skin radiant, nourished and moisturized. For best results, apply morning and night. 500mg CBD per 1oz container. 100% pesticide free, non-gmo hemp CBD oil from mature stalks and stems of the hemp plant.